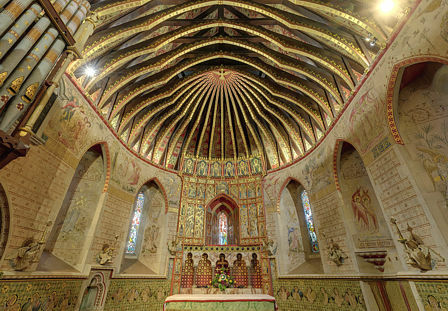 St Peter’s Church, at Hascombe in Surrey was described by Betjeman as ‘a Tractarian Work of Art’. Built on a site of Saxon origins, by 1862 the medieval church which was then over 600 years old had become so dilapidated that rebuilding was considered the only option. Led by the Rector, Canon Musgrave, Henry Woodyer (a pupil of Butterfield) was commissioned to design a new church. The simple plan of nave and apsidal chancel became a canvas for a richly decorated interior. The walls of the nave are painted with the 153 fishes of the second miraculous catch of fish, all tangled in a net which is being dragged in by seven of the disciples. Above the chancel arch is Christ in Majesty flanked by the 12 apostles. 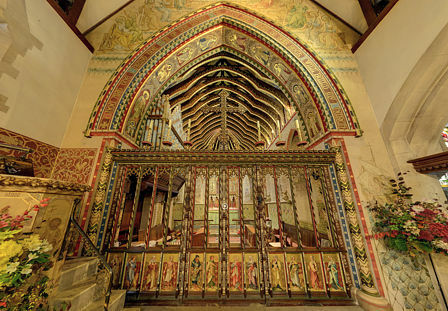 The rood screen (a survivor from the previous church) was restored and repainted. The chancel is decorated with a riot of angels. Surrounding the reredos are the saints of the nineteen churches of the Rural Deanery. In the windows and splays are scenes in the life of Christ. The central window shows the Crucifixion. In the spandrils are stories from the Old Testament from the expulsion of Adam and Eve from the Garden of Eden to the Archangel Gabriel appearing to Zaccharias. You can see a 360° panoramic tour of the church by following this link. This entry was posted on Wednesday, October 11th, 2017 at 4:35 pm and is filed under Panorama. You can follow any responses to this entry through the RSS 2.0 feed. Both comments and pings are currently closed.